We provide wide range of bean bags for our customers. 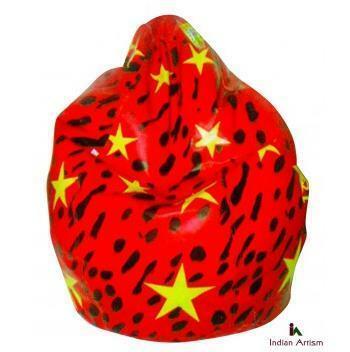 This is a amazing bean bag with ravishing red color and bright yellow star pattern all over. Made of leather good quality leather and are very comfortable. Established in the year 2013, Indian Artism is one of the prominent Manufacturers, Traders, Suppliers and Exporters of the global market indulged in offering a beautiful collection of antique products. Widely appreciated and brought by our clients to enhance the ambience of their houses and offices, our offered product array includes Box, Coaster, Book Holder, Temple, Brass Antique, Brass Artware, Flower Vase, Gramophone,Beads & Stone, Jute Item, Leather Item, Raison Item, Gun Metals, Wedding Artware, Lamp, White Metal, Saree, Soft Toys and Indian Jewellery. Within this array we are offering a wide assortment which includes Ganesha Statues, Elephant Statues, Folding Chair, Royal Dining Set, Screen Partition, Carved Screen Partition, Chess Board, Incense Holder Hexagonal, Belt, Book Holder, Temple, Gramophone, Mukut Ganesha, Gandhi Ji, Ring Setter, Indoor Fountain, Heart Shaped Pillow, Teddy Hand Bag, Classy Earrings and Antique Bracelet. The entire product range offered by us is widely appreciated for their aesthetic designs, superior finish, fine craftsmanship and optimum polishing. This offered range of decorative items and antique pieces is highly accredited among our customers for their sturdy construction and longer life. Known for their uses in offices, buildings, and homes as decorative items, our offered products are manufactured in compliance with the industry laid standards and norms.